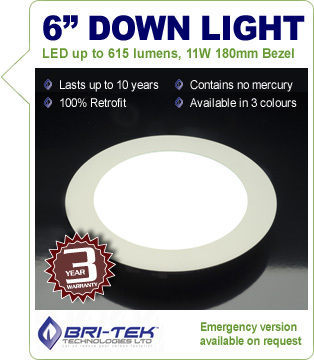 Latest generation 150mm LED downlight providing exceptional warm, cool or natural day light, far superior to incandescent, halogen or CFL. Aesthetically the sleek 20mm deep, white powder-coated aluminium frame will enhance any contemporary domestic or commercial space. Technically the high quality 3528 SMD chips, frosted glass diffuser and wide 105o beam angle eliminate the tell-tale LED dots and bright circles that can appear on the floor. With a light output comparable to a traditional 60W lamp, this 11W 40,000 hour LED unit makes financial sense in terms of running costs and maintenance overhead. Dimming & emergency 3-hour backup options available subject to a 12 day lead time. As the cost of living in the 21st century rises Solarcrest presents you with a 22nd century solution to help reduce your energy consumption and reduce your impact on the environment. LED lighting technology has come a long way from its inception in the early 1900s. The choice to replace old inefficient incandescent bulbs with Low energy LED replacement bulbs has never been easier. Solarcrest strive to provide a variety of contemporary designs and cap fittings to give you the widest choice of replacement LED lamp to brighten up your home. What this means that not only do LEDs replace existing lamps they are more aesthetically pleasing and enhance the feel and look of any enviroment.